Brea Reese Glitter Watercolor and Mermaids! Hello everyone, Kerry Engel here today on the Creative Scrapbooker Magazine blog. I’ve been playing a lot with Brea Reese watercolor inks. They are very bright and beautifully transparent. The glitter inks are just yummy. They are perfect for making the galaxy paintings that you see all over Instagram and Pinterest. Brea Reese watercolor inks are dye-based ink and they dry quickly. They are very concentrated…a little goes a long way. If you put them in a paint pallet they will dry in the pallet and when you come back later with a wet brush you can re-activate them. To make this card download a mermaid tail and turned it into a stencil. You could use any large silhouette type shape with this technique. Large flowers work well too. To begin, trace the tail onto watercolor paper. Use the rough side of 140 Lb, cold pressed watercolor paper. 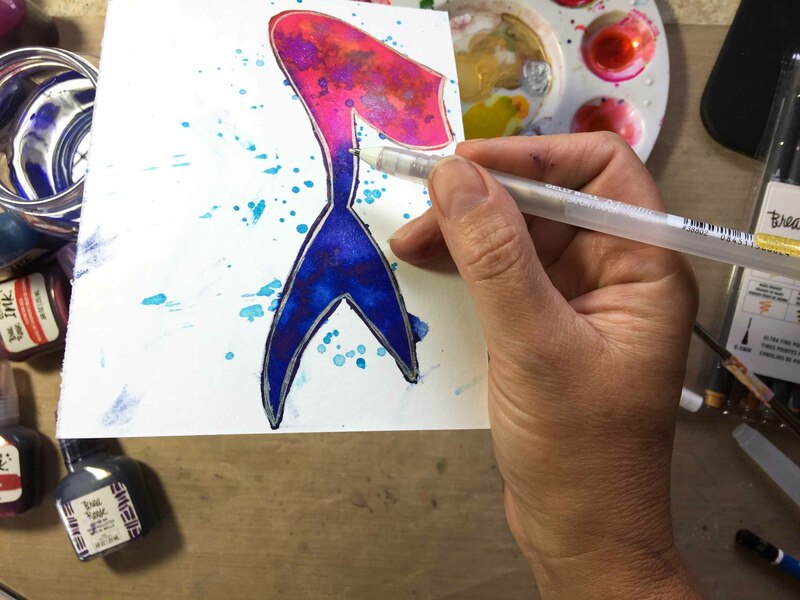 Paint the inside of the traced shape (mermaid tail) with water, this will help define your edges and it will allow the ink to flow. Move quickly to the next steps so your shape doesn’t dry out. If it does simply add a bit more plain water. 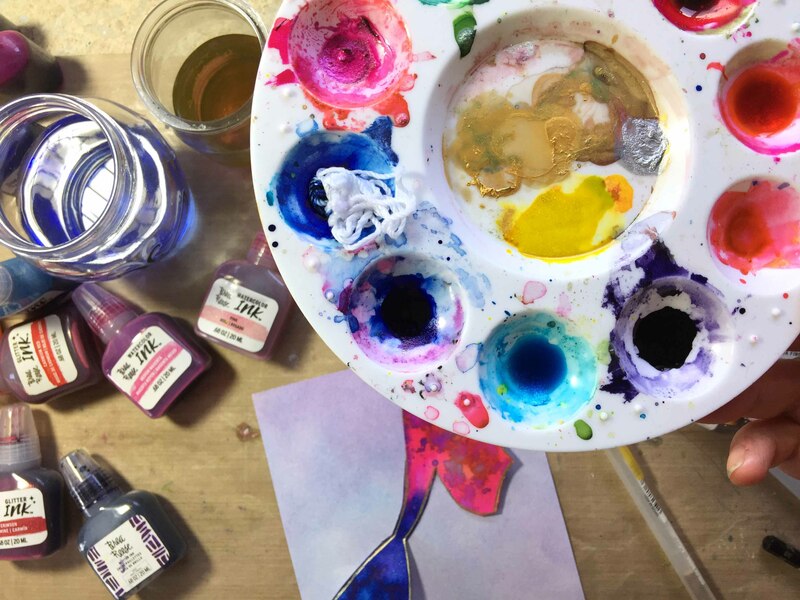 Wet your paintbrush with water, dip and load the brush with Brea Reese watercolor ink. Layer the ink on top of the wet paper, keeping it inside the tail. Lay down different colors of ink, allowing the ink to flow into each other. Splatter ink on top of your painted tail. You can do this while it’s still wet for a softer splatter or when it’s dry for a more defined look. When dry outline the tail with a gold Sakura Gelly Roll pen and add tiny white dots or stars with a white Sakura Gelly Roll pen. Cut out the tail. 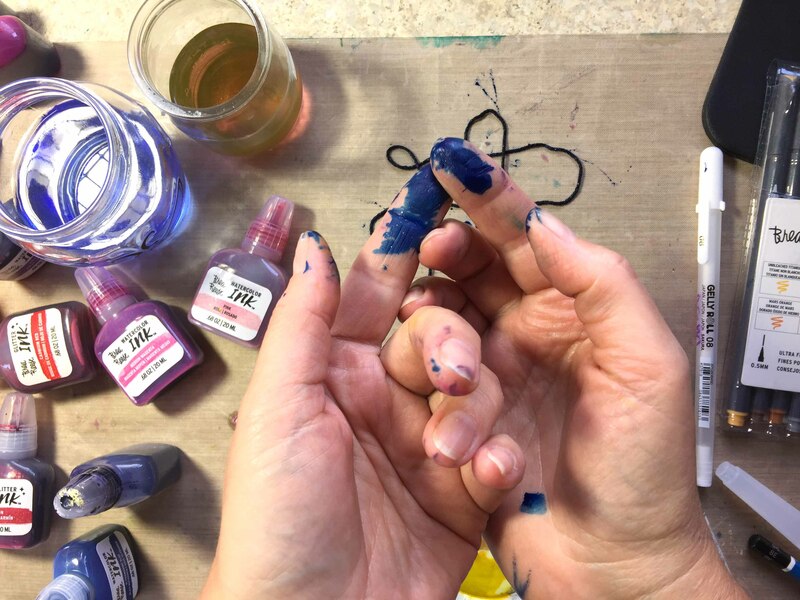 To create a net dip cotton crochet yarn into the Brea Reese watercolor ink and let it dry. Cut the string into 3-inch pieces and tie them together. If you enjoy stained fingers don’t wear gloves. Everyone else should probably wear a protective glove. Watercolour paper from Momenta makes a great background. 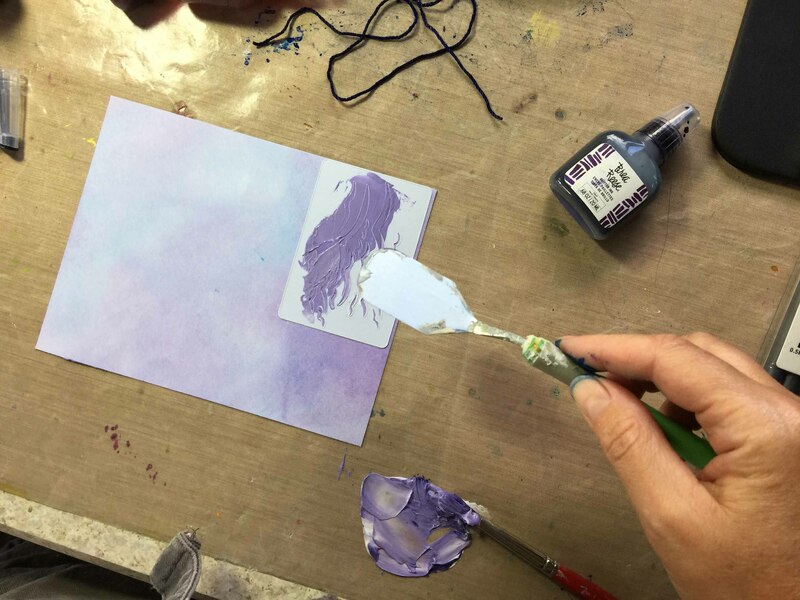 Mix a couple drops of ink with texture paste to create a lovely purple texture paste. Mix ink with texture paste. Using an Art-C Stencil apply the purple tinted texture paste to the cardbase. Let the birds dry and then add more texture paste birds to the cardbase. Print out the handmade title. Adhere the elements with Therm O Web Mixed Media Adhesive. Mount the tail on Foam Squares to raise it up a bit. 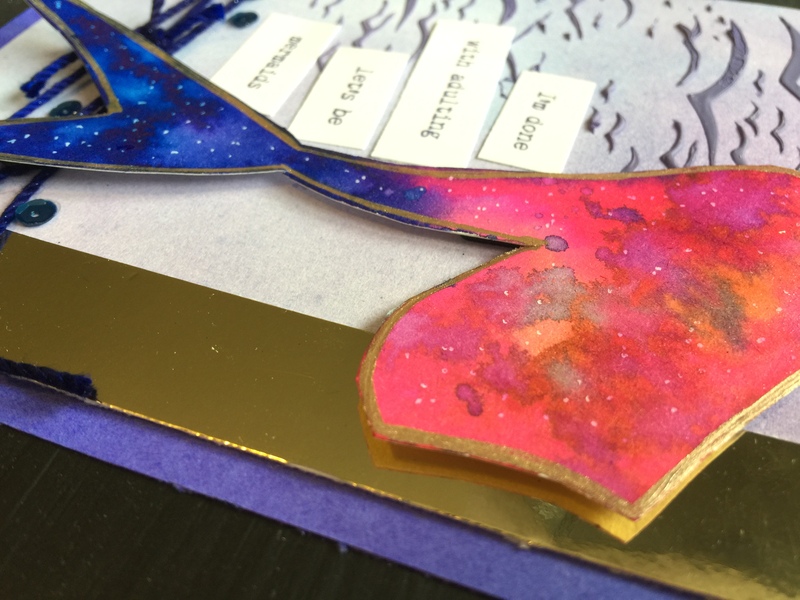 Use a scrap piece of gold paper to create an edge on the right. Have a wonderful week everyone! That is such a kwel card! Love the step-by-step for this. The Brea Reese inks look like a lot of fun to play with. Great card!